Take a tour of the world-famous Oval stadium, a wonderful day out for any sports fan. From hosting England's first home international football match and first FA Cup Final, to international rugby matches and most notably cricket's first Test Match against Australia. A Kia Oval ground tour begins with tea and coffee in the Micky Stewart Members’ Pavilion, followed by a 90-minute guided tour, giving exclusive access around the ground. From unique insight into groundsmanship, to the players’ training routines, guests on the Kia Oval Ground Tour will learn all about the inner workings of the Club and re-live some of the most memorable moments in cricket. In addition to access to the Micky Stewart Members’ Pavilion, guests can access the media suite including where Sky Sports Test Match coverage takes place, hospitality areas, changing rooms and much more making it a wonderful gift for any sports fan. For an extra special tour, the Quintessentially British Experience includes Afternoon Tea, a Tour and a Match Ticket on a selected County Championship or One-Day Cup match day in 2018 for just £40pp. 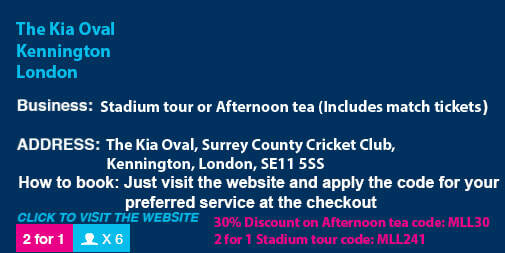 This will include a match-ticket as well as a 90-munute guided tour followed by a full afternoon tea. Please note this is only available on selected match-days.